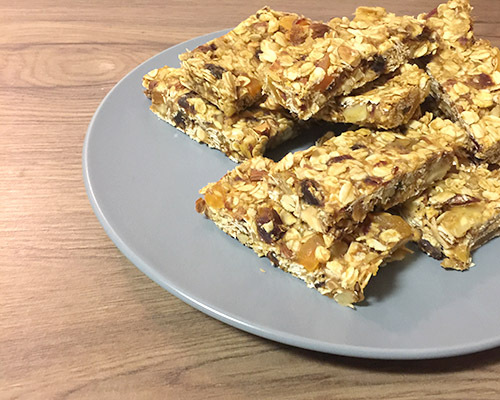 Muesli bars are such a great snack to have handy for those low bloody sugar moments and for hangry children! Recently we’ve been feeling guilty every time we open an packet and discard yet another wrapper. Not to mention all the hidden nasties in store bought muesli bars. 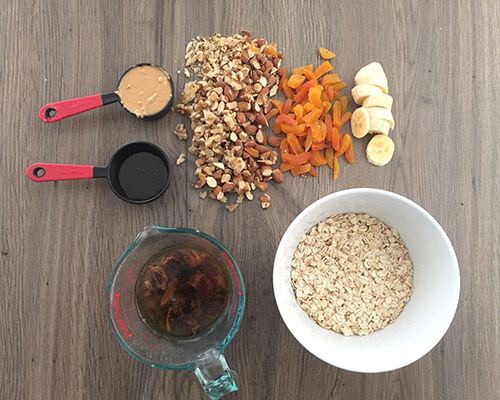 This super easy recipe for Zero Waste Muesli Bars is low-sugar and makes good use of those odd pantry bits and pieces. Additions to try: I added some chopped apricot but you could add any dried fruit you like. Or pepitas, sesame seeds, shredded coconut, chia seeds – basically anything in your pantry! Place dates in a heat proof dish and cover in boiling water, allow to soak for 5 mins. Once they are are nice and soft you can chop by hand or blend in a food processor. 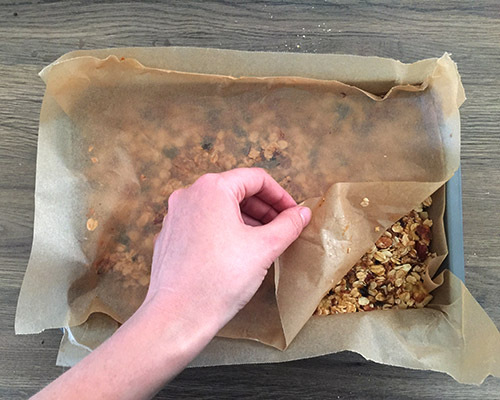 Place the oats and almonds on a baking tray and bake at 180° for 10-15 minutes – this will make them easier to digest. In a large bowl combine oats, chopped nuts and any additions like dried fruit or seeds. In a small saucepan combine honey, nut butter and coconut oil stir over low heat, until mixture goes smooth. Remove the saucepan from heat and add the chopped dates and mash half banana into the mixture. Poor over the oats and mix together thoroughly and transfer to a lined slice tin. Place another layer of baking paper over the mixture and press firmly with your hands or a use a glass to get an even, flat surface. (Press nice and hard or you’ll end up with granola, which is also delicious but harder to pack in a lunchbox!) Bake in the oven for 30 mins at 180° or until lightly golden. Allow to cool and cut into about 10 bars. Store in an airtight container or use a beeswax wrap for lunch box or hand bag. Delicious! *NOTE: If you’re wanting to go nut-free you can leave out the chopped nuts and nut butter and bake for a little longer – 40mins to help hold everything together.